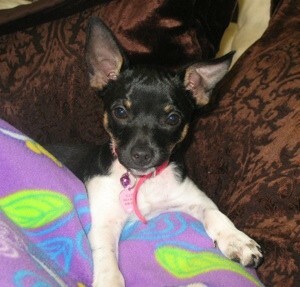 Allee is a Rat Terrier/Chihuahua, the vet says she is 3 months old. My daughter found her in an alley, then later we found the owners. She had ran away but they were giving away her and her brother. She loves to snuggle and has taken over my favorite blanket. Allee loves to chase things and almost brings it back. She is new so she has a lot to teach me. Allee has came into my life when I really needed a friend so she is really precious to me. And the dogs just keep getting cuter and cuter and cuter! I would love to have one like her. She's a doll!!! What a sweet little pup!